With this platform we are taking our commitment one step further: additional research and more in-depth information will show you why wearing animal fur is inacceptable. 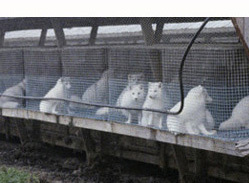 Based on the facts, everyone can form his or her own opinion regarding fur production. Decide for yourself whether you can believe the claims of the fur lobby that animal welfare is their primary concern or whether everything is simply green wash.
New Campaign of the Zurich Animal Protection Association: "real fur - really cruel"
March 15, 2018: Versage plans to dispense with real fur. October 12, 2017: Gucci announces to dispense with real fur in spring / summer 2018. September 20, 2017: An online mail order company for luxury fashion became fur-free: With Yoox Net-a-Porter, 750 companies worldwide are now Fur Free Retailers and abstain from real fur. September 15, 2017: Globus becomes a member of the Fur Free Retailer program and is now fur-free.